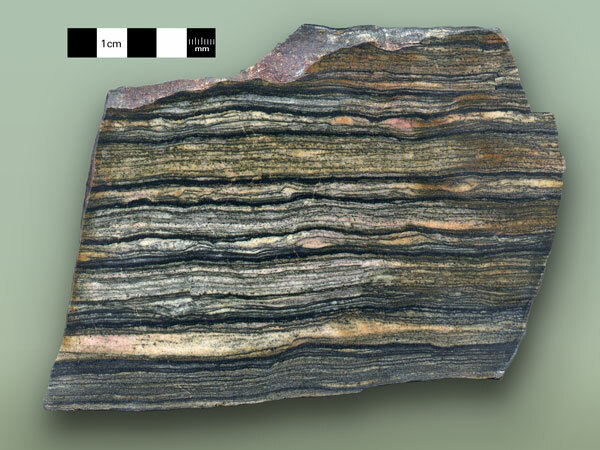 Multiple light (sand) and dark (silt and clay) bands in this piece of shale from the Big Cottonwood Formation indicate the varying energy of rising and falling tides. Photo courtesy of Marjorie A. Chan, Dept. of Geology & Geophysics, University of Utah. This tour begins 1 billion years ago when the area was a tidal environment at an ocean shoreline. The tidal environment is preserved in the now-tilted layers of quartzite and shale that make up the canyon walls for the first 6 miles. In some areas, the shale is metamorphosed into argillite or slate. Traveling farther up the canyon, you progress through times when different ancient seas covered the area; the sediments left on the ocean shore and floors are now the 600- to 100-million-year-old sandstone (and quartzite), shale, and limestone. Fingers of magma intruded up through these rocks about 70 million years ago, and can be seen between miles 7.3 and 8.3 where the red- to dark-colored intrusions contrast with the white limestone and marble. These intrusions are called dikes when they cut perpendicular through the limestone/marble layers or sills when they parallel the bedding. The head of the canyon reveals 35-million-year-old igneous activity where a large body of magma intruded into the surrounding rock and, while beneath the Earth’s surface, then cooled and hardened into a gray granitic rock called granodiorite. Millions of years later, after the overlying softer sedimentary rocks eroded, the granodiorite was exposed and now makes up the peaks surrounding Brighton. About 30,000 to 8,000 years ago, Brighton was buried under hundreds of feet of glacial ice. The main glacier flowed down the canyon 5 miles where it abruptly ended at Reynolds Flat (mile 9.0). At this point you can see an obvious difference in topography: a narrow, twisting canyon below Reynolds Flat and an open, straight canyon above. This illustrates a classic example of a river-carved “V-shaped” canyon (below Reynolds Flat) and a glacier-carved “U-shaped” canyon. One of the best documented and oldest known records worldwide of tidal rhythmites is in Big Cottonwood Canyon. Discovered in the 1990s, this record is enthusiastically being researched, in large part to provide clues to ancient lunar cycles. Yearly, monthly, and even daily and semi-daily tides are recorded in the black shale of the 850-million to 1-billion-year-old Big Cottonwood Formation. 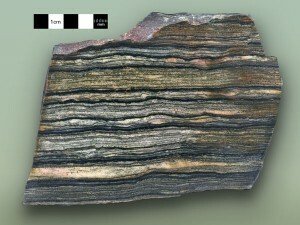 Within the shale are thin, alternating layers of light-colored sand and dark-colored silt and clay. The sand was carried by peak (strong, dominant) flows and the silt and clay by slack (weaker, subordinate) waters at changing tides. Thus, these thin individual bands record daily tides and can be counted much like we count tree rings. Because the gravitational pull of the moon and the sun cause tides, the length of an ancient day and lunar month can be determined from these tidal rhythmites. Long ago, the moon took less time to orbit the Earth, the Earth was spinning faster, and thus the days were shorter and there were more of them in a year. These records in stone indicate that one billion years ago, a day on Earth lasted only 18 hours, there were 13-plus months in a year, and about 481 days in a year! (Information supplied by Marjorie A. Chan, University of Utah and Allen W. Archer, Kansas State University).